The state level teachers trophy today began and kick off by the Parliamentary Secretary Sorts & Youth Affairs Nyamar Karbak here at Dera Natung Government college play ground amid huge gathering of sports lovers. Addressing the gathering as chief guest Karbak lauded the NGO for organising such mega event and hope that it need to expand its horizon to other parts of state. He said that today is National Sports Day and inaugurating the event itself signify the respect and regards to the teaching community specially teachers who build the future for the students who are future of tomorrow. 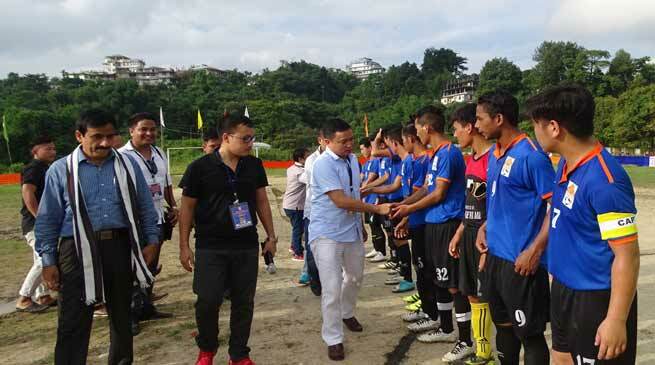 Karbak said that the government of Arunachal Pradesh have been promoting the sport and even providing opportunity in employment to 10 % in Police and 5 % in other department and many meritorious sportsperson have been benefited so far. He appeal the participants to play in team spirit with brotherhood. He assured to take up all the expenditure for the 2018 edition and further to take up the issue of organising the event by state government with the department officials and government. AAPSU General Secretary Tobom Dai speaking as guest of honour said that we the youths need to take up sporting events and other co-collar activities which are need of the hour to make ourselves fit and fine. He also appeal the students community to study well apart of participating in different activities for the name and fame of community state and nation as a whole. Chief Advisor and youth leader Tanya Angu, Organising Chairman Narba Pangia among others address the gathering. Tanya Angu said that though soccer tournament which started in 2009 but due to some reason it was not played in previous years and again it began its activates since last year and shall continue its efforts for the development of sports and games in state under the ages of Ajing United (NGO) which deals with multipurpose activities including social works. The Organising Chairman while taking to media said that there are 18 teams from different University, college an Schools of state and today the first match played between Government College Seppa and Himalayan University, the final match will be played on September 5 on the eve of the Teacher day.